Every business or organisation should have a unique website that truly stands out. Whether you’re looking for a single lead generation landing page, or a multi-page information based brochure site, or even a fully featured eCommerce solution, our website design solutions can help. Up to 80% of web users are searching and browsing on their mobiles. That’s why all the websites that we design are fully responsive, meaning that they’ll display perfectly on any device or screen size. We’ll ensure that your new website is well prepared for entry into the most popular search engines with keyword-relevant page titles and metadata – so you can start making your impact on Google. You’ll be given administrator access to your website so you can log in at any time to manage your content, update pages, create articles, organise menus, upload images and so much more. We approach all websites from the ground up, including all of the required planning, research, conceptual design and prototyping stages. This allows us to really focus on meeting your objectives with a bespoke and fit-for-purpose solution. We’ll even help secure your domain name and handle the hosting for you, freeing you up to carry on with what you do best without getting bogged down with the technical stuff. 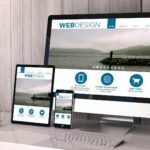 Unique page layouts, custom branding, contact forms, FAQ pages, blogs and news platforms - give your website visitors exactly what they're looking for with a website experience to remember.